Balance and proprioception consists basically of the conscious and subconscious awareness of our body’s position in relation to the space around it and the maintenance of stability of our centre of gravity. Our body uses this sensory feedback information to orient itself in order to complete everything from simple daily tasks like walking to more complex movements in athletics like jumping and landing, yoga or hitting a tennis ball with a racquet. Additionally, our body use proprioceptive information to protect its muscles and joints through unconscious stabilization and proper positioning to prevent overstretching or tearing or tendons, ligaments etc. After a serious injury or even as we gradually age, our body’s proprioceptive ability is altered and diminished, potentially resulting in further injury and dysfunction. Research studies have even shown proprioceptive deficits as responsible for the initiation and advancement of joint degeneration in otherwise injury free and healthy subjects. With that in mind, it is easy to see that adding balancing and proprioceptive exercises into your workout program or injury rehabilitation protocol will greatly aid in contributing to a full recovery and prevent future joint dysfunction. Balance and proprioception is controlled by our central nervous system and is controlled by 3 main sub-systems: the somatosensory (the nerves in our joints, tendons and muscles) the vestibular system (the inner ear canals) and the visual system. 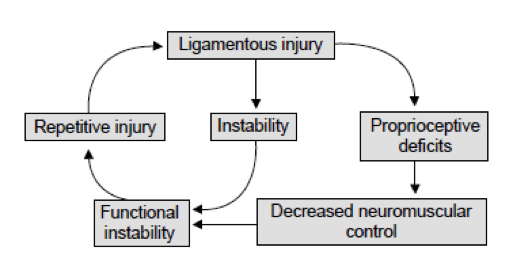 If any one of these subsystems is injured or working improperly, dysfunction in balance and function ensues. Fortunately, balance and proprioception can be easily trained and added into any workout for individuals of all ages and skill levels. Below are some effective examples of proprioceptive exercises and their progressions to increase challenge and difficulty. A key concept to remember while attempting these is that there is a possibility of falling or losing your balance. Exercises can be done with a partner supervising and spotting you or keeping a supportive device within reach like a railing or doorframe. Single leg stance: The simplest form of balance training, but a necessary component of daily life. Having only one foot as a base of support forces the body to centre its mass over a single support leg and balance. Single leg stance with eyes closed: (pictured below) same as the exercise above, only with both eyes closed. This takes away one of the 3 sensory inputs of balance and relies heavily on the other 2. 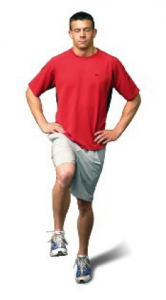 Single and double legs stance on unstable surfaces: A progression from the above exercises is adding in an unstable surface to stand on which increases the difficulty of balance required to maintain posture. Unstable surfaces can include: wobble boards, foam pieces, pillows and bosu balls. Again adding closed eyes to the below exercises further compounds the difficulty of the balance/proprioception exercises. Ask your Athletes Care Chiropractor for even more difficult progressions once you have safely mastered these ones. Remember to keep safety in mind and have a training partner or personal trainer accompany you and patiently progress to increasing the challenges on your balance/proprioceptive system through these exercises to help rehabilitate from injuries like ankle and knee sprains and prevent joint degeneration and falls.